There was a mystery plaguing me a little while back. I was thinking about some of the oldest cars still in production–your Dodge Journeys and Morgan Plus 8s of the world. It was then that I realized today’s Toyota 4Runner is positively ancient; basically having been in production, virtually unchanged, for nearly a decade. And that is exactly what makes it so, so good. We talk about the Carpocalypse a lot here. The car is dying, I’ve personally lamented. The virulent automotive virus that is the SUV plague is infesting every auto company. Ford, for instance, has allowed the disease to simply wash over it with the Mustang being the last remnant of The Car Company That Was, like the faint glimmer of the original visage under all of the horrid buboes. But for all the extreme hyperbole, that’s not really accurate. Ford’s lineup isn’t chock full of SUVs, not really. The Ecosport, Edge, Escape, and Explorer are all pretty much built on traditional car platforms, to traditional car standards of noise, vibration, and harshness. What you end up with is something that drives like a car, rides like a car, but is easier for grandma and grandpa to get in and out of. Until the new Bronco comes out, the Expedition is pretty much Ford’s only “true” body-on-frame SUV, built on Ford’s T3 platform that also underpins the Lincoln Navigator, and which shares a bunch in common with the “P” platform that goes underneath its full-size pickups. As for the Ford Flex–we don’t talk about the Ford Flex. Seriously, don’t mention it. It is the beloved golden child of Ford’s lineup, but we think Ford’s forgotten about it. If no one reminds them, maybe they’ll just keep making it. 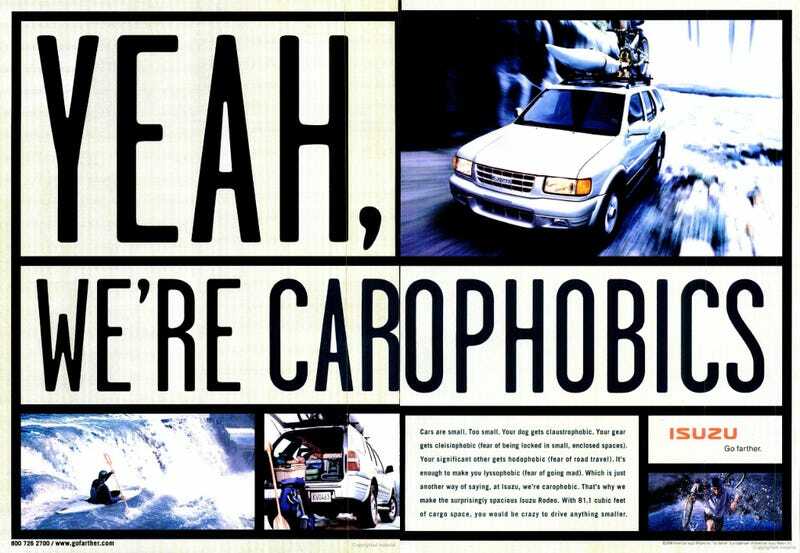 So for a company that is, on the surface, going the way of late-’90s Isuzu, it isn’t really. It’s still making cars, just taller and chubbier ones. For Ford buyers, it works. But what about the people who want SUVs? I mean “real,” traditional, beefy SUVs. The ones that make no apologies for what they are. The ones that have zero interest in things like comfort or space or ease of entry, because those could serve as a detriment to the truckiness of the whole experience. Well, for those people, there’s the Jeep Wrangler, which sort of goes to the extreme with the whole “toughness” thing, complete with removable doors and a removable roof and probably removable everything, if you really wanted. And also, it costs $12 million, for some reason. But say you don’t want a Jeep. What is there for you, really? Off the top of my head, and after driving one, all I can think of is the Toyota 4Runner. And so can 139,694 other people. That’s how many people bought a Toyota 4Runner in 2018, according to the company. And while that sounds like a lot, know in your heart that yes, it is a lot. As the 4Runner ages, its sales are actually increasing dramatically. Toyota shipped more than 40,000 more 4Runners in 2018 than it did in 2015, when it sold only 97,034. That, in short, is Not Supposed To Happen. When cars get stale, people are supposed to stop buying them. Take another body-on-frame Toyota that’s been in production forever, the Land Cruiser, sales of which have essentially flatlined at about 3,000 per year as that very truckish SUV soldiered on mostly unchanged since 2007. Why buy a Land Cruiser, one could ask, when you could get literally anything else for the same price and be totally satisfied that you’re buying the latest and greatest? In its extremely competitive category, you’ve got everything from Range Rovers and Mercedes G-Wagens to the BMW X7 and Cadillac Escalade, depending on how much off-roadiness you want. All of which offer a lot more refinement or technology or power or efficiency or all of the above. At least that explains why no one’s buying the Land Cruiser. But the Toyota 4Runner should, on paper, be in the same boat. Since we’ve already very much established that it isn’t, I was confused. Now, however, I totally, entirely get it. And that’s what makes it undeniably cool. Climbing into the big 4Runner is not easy, not for those with little legs or the dusty skeleton of an aforementioned grandparent. Even the base SR5 model comes complete with a full nine inches of ground clearance, less than an inch off a Wrangler (though the space between the car and the road can increase in both the Jeep and the ’Yota, depending on which boxes you tick). But once you’re in, you’re in. The interior is nowhere near as roomy as its car-based would-be competitors, and the navigation screen is so tiny as to be downright embarrassing. Everything feels like it’s from 2005 at best, but that doesn’t matter. You want a truck, you get a Truck. There are overhead buttons for off-road systems. The dials are positively vast and chunky, for better use with a pair of ridiculously oversized gloves on, or because your digits are just that beefy. 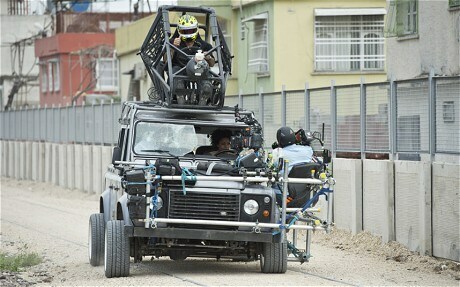 There are indicators for which way your wheels are turned, which is helpful for driving over rocks, and you peer out over the hood as if you’re driving one of the James Bond stunt cars. It dives when you do a hard stop, and it leans way back when you really give it the beans from its 4.0-liter, 270-horse, 278 lb.-ft V6, which shunts energy through a slightly clunky five-speed transmission through a world where seemingly everyone has transitioned to at least six, if not more, gears. Take a corner slightly too hard, and yeah, it leans like a pirate ship. It’s hilarious, and that’s what makes it fun. 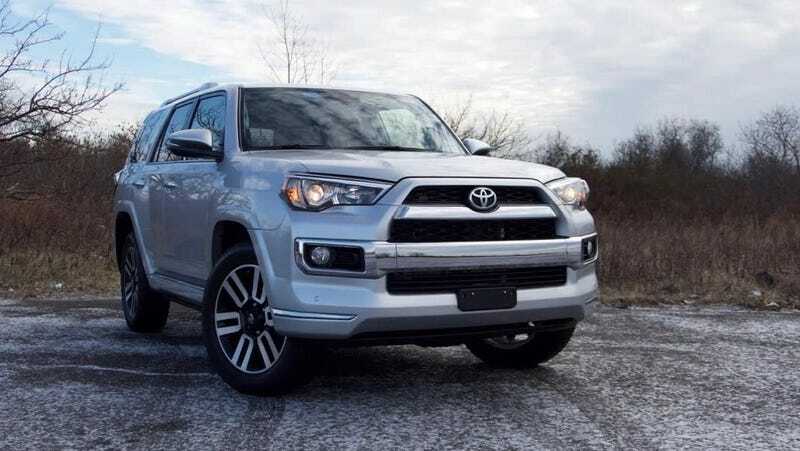 In this day and age, when coupes are sedans, when SUVs are coupes, and when pickups are cars, the 2019 Toyota 4Runner is the last of a dying breed. Okay, so most people will only take it over slight bumps. It’s an in-your-face, honest-to-goodness truck. One of the last still on sale. And I totally love it.